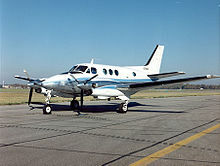 For the current aircraft most commonly used as Air Force One, see Boeing VC-25. 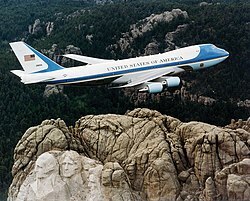 For the 1997 film, see Air Force One (film). For other uses, see Air Force One (disambiguation). 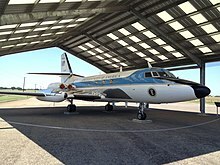 ^ "First Air Force One plane decaying in Arizona field". NBC. AP. 2 October 2015. Retrieved 5 October 2018. ^ Ball, James (28 December 2018). "How a Guy With a Camera Outsmarted the United States". The Atlantic. Retrieved 25 January 2019. ^ "Trump Wanted a Cheaper Air Force One. So the USAF Is Buying a Bankrupt Russian Firm's Undelivered 747s". Defense One. 1 August 2017. Retrieved 2 August 2017. ^ Ostrower, Jon; Browne, Ryan (5 August 2017). "US finalizes deal for new Air Force One jets once destined for Russian airliner". CNN. Retrieved 27 January 2018. ^ Martin, Swayne (16 October 2014). "6 Gulfstream Missions That Have Nothing To Do With Luxury". Bold Method. Retrieved 18 November 2015. 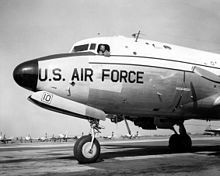 ^ "Douglas VC-9C | Castle Air Museum, Atwater & Merced". Castle Air Museum. Retrieved 27 January 2017. ^ McAllister, J.F.O. (28 July 1997). "Air Force One: On the Real Thing, No Pods and No Parachutes". CNN. TIME. Retrieved 12 November 2016. ^ Berman, Russell (31 January 2015). "Air Force One-Point-Three - After a quarter-century of service, the aging presidential airplanes are being replaced by a pair of state-of-the-art Boeing 747-8s". The Atlantic. Retrieved 12 November 2016. This page was last edited on 6 April 2019, at 08:02 (UTC).